"After the international release of 'Beat Street' – the 1984 movie chronicling New York's hip-hop scene – breakdancing influenced pantsula style in Johannesburg's townships." Experience this showcase of two distinct South African dance traditions, born from the perseverance of the human spirit. The two deeply rhythmic ensembles, Real Actions Pantsula and Stimela “The Gumboot” Musical, uplift, unite and tell a story as they entertain and follow in their historical tradition of spreading awareness of socioeconomic and political challenges. 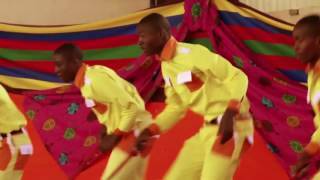 These communicative dances have become important parts of restoring, revitalizing and preserving South African culture. Gumboot dancing was born out of the oppressive gold mines of South Africa. Forbidden to speak and in almost complete darkness, the slave laborers developed their own language by slapping their gumboots and rattling their ankle chains. Above ground, it became a popular folk dance. PANTSULA was established in 1992 by Sello Reuben Modiga with the aim of building innovative, creative minds through dance. Pantsula was established after realizing the talent among the youths of Orange Farm. The group worked with 30 talented teenagers around the community.